The anvil, hammer, and tongs in front of the Waterloo Metal Works forge. John Rayer is ready to use the power hammer to further form this steel. Dark Horse Brewing's best known symbol is part of a large hinge for a new door at the brewery. A row of tongs. The tools are designed to hold different shapes and sizes of metal. A section of railing in the Art Nouveau style. A sampling of floral deisgns by John Rayer at Waterloo Metal Works in Jackson County. From the forge to the anvil to be shaped. Listen to the story here. You'll love hearing the hammer on hot steel. John Rayer of Waterloo Metal Works. Rayer’s blacksmith shop is in the lower level of a barn not too far from the Waterloo Recreation Area in Jackson County. The rough rock walls seem perfect for the job that has to be done here. I was wondering how being a blacksmith today differs from 70 years ago. “Seventy years ago your blacksmith would have been the mechanic in a village,” Rayer explained. The blacksmith repaired things. Wagon tongues, tractor hitches, or forging pieces to keep a piece of equipment running just a little longer. Today, most of the blacksmiths are doing something a little more artistic. “We do a lot of work on buildings: railings, lighting fixtures, pot racks, things like that,” Rayer said. Rayer says he was forced into a different career because of the Great Recession. He’d been apprenticing with a master blacksmith because he wanted some inspiration in his life. When he lost his day job, he says blacksmithing was the only thing he knew how to do. He’s not alone here. He offers lessons and his apprentice, Luke Blough, has his leather apron on, watching as Rayer at work. “I’ve just always loved blacksmiths. I love to see how they work with their hands on the metal. It’s not something on a screen,” Blough said. Rayer has done forged architectural work all over. He’s worked in Alaska, New York, Virginia, Bahamas, Ecuador, and a lot here in Michigan. He says Art Nouveau doesn’t have to be like so many other architectural styles which call for symmetry. “It’s botanical. It doesn’t have to be perfect. If it looks right, it is,” he said. 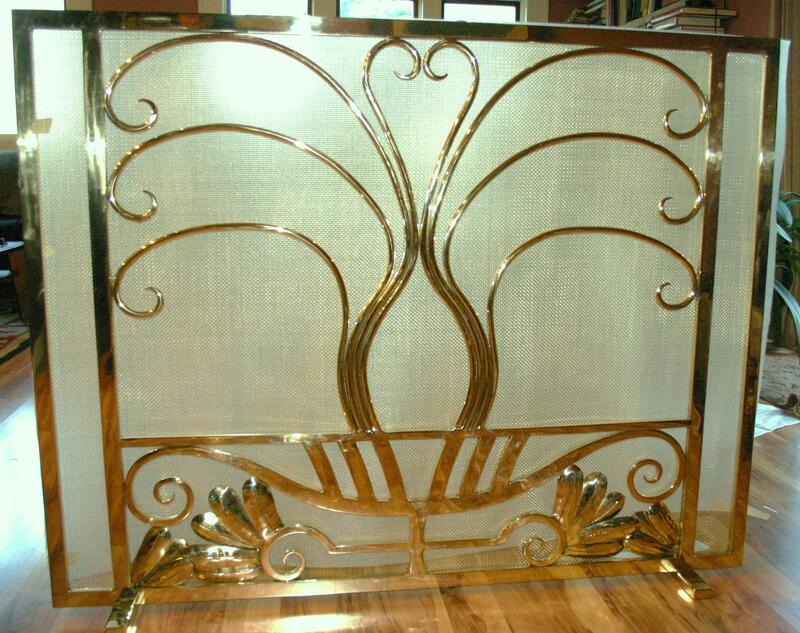 This brass fire screen, in the style of Edgar Brandt, won "Best Fireplace in Detroit" in 2015. Support for arts & cultural reporting on Michigan Radio comes in part from a grant from the Michigan Council for Arts and Cultural Affairs and the National Endowment for the Arts.